In part two of our interview with Monster Jam superstar Shane England (read Part 1 here), he tells us in detail what happened to his Monster Truck (a.k.a. the Big Kahuna) during the shoot for our exclusive video on his sprawling Texas ranch. Read on to find out how Slime helped save the day! Slime: What happened to the Big Kahuna the day of the Slime video shoot? How did the vehicle manage to break? Shane England: After we staged a few shots for the Slime video shoot, the front steering of my Monster Truck was unresponsive. After investigating, we found that a set screw on the power steering pump coupler had backed off. We made some repairs on the spot, and shooting continued as planned. Then, while attempting a “moonwalk” maneuver during a freestyle run, the engine shut off once the truck was fully vertical. The fuel injection system sensed a loss of oil pressure and shut the truck off, therefore rendering the truck powerless and counter maneuvers unable to be performed, so the truck rolled over forward onto its lid (you can actually witness this happen in the video!). The body of the truck was destroyed, but our spirits remained high as always. The truck was rolled back onto its tires, then fired up, and I drove it back to the shop. Back at the shop, the truck bed was removed and the remaining body secured. We then noticed that the reverse gear in the transmission was damaged, but all of the forward gears were working as they should, and we were thankfully able to complete the shoot. When did you apply the Slime Tire Sealant to the tire? SE: The day prior to the shoot, we had a left rear tire that had a leak. We had noticed that it would leak down overnight during the last two weeks of competition. We rigged up and applied 2.5 gallons of Slime Tire Sealant into the damaged tire. We then rolled the tire around to allow the product to coat the inside, and I pumped 23 psi of air into the tire and mounted it onto the Big Kahuna. How did the Slime Tire Sealant help you continue with the shoot? SE: The Slime Tire Sealant completely secured the leak in the left rear tire. In addition, I’m happy to say the tire is still maintaining the air pressure I applied, and it has been a month since the shoot! Have you used Slime before with similar results? SE: When I’m not racing all over the country with the Big Kahuna, I enjoy off-roading adventures with my crawling rig and also maintain a large farm. With the variety of tractors, ATVs, trailers and other equipment I use in these activities, getting holes in tires is inevitable. We use Slime Tire Sealants in just about everything on the farm. Preventative maintenance is an everyday thing in my life -- from racing to the farm -- and I try to correct issues before they become a problem. I’m a firm believer in Slime Tire Sealants, and adding it to tires will help you prevent flats before they happen. 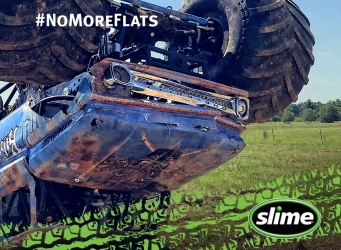 No more flats!